A polysomnogram typically records a minimum of twelve channels requiring a minimum of 22 wire attachments to the patient. These channels vary in every lab and may be adapted to meet the doctor's requests. There is a minimum of three channels for the EEG, one or two measure airflow, one or two are for chin muscle tone, one or more for leg movements, two for eye movements (EOG), one or two for heart rate and rhythm, one for oxygen saturation and one each for the belts which measure chest wall movement and upper abdominal wall movement. The acquisition and processing of bioelectrical signals that appear in the human body is a common theme in clinical studies for evaluating the health status of a patient. Polysomnography is used to diagnose or rule out many types of sleep disorders including narcolepsy, periodic limb movement disorder, REM behavior disorder, parasomnias, and sleep apnea. Our new sampling and reconstruction technique reduces the amount of data for storage or transmission because it allows to reconstruct the biomedical signals from far less measurements than usual. 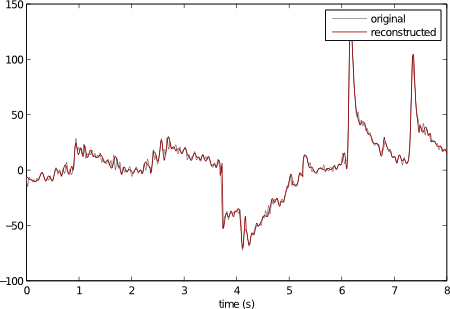 The samples are collected at a fraction \( 1/r \) of the Nyquist rate (in Hertz), hence achieving a compression rate of \((100/r)\) %. As an illustration we show the reconstruction of an EOG signal using only 9.1% of the data \( (r=11) \) that were originally collected at 256 Hz. The original signal is available here. The cross-correlation for the compact reconstruction is 99.20 and the normalized root-mean-square error is 1.68. 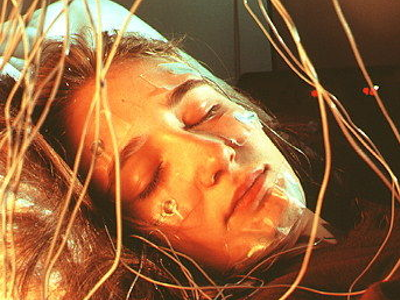 Similar results can be obtained for EEG, EMG and other bioelectrical recordings made during sleep analysis.